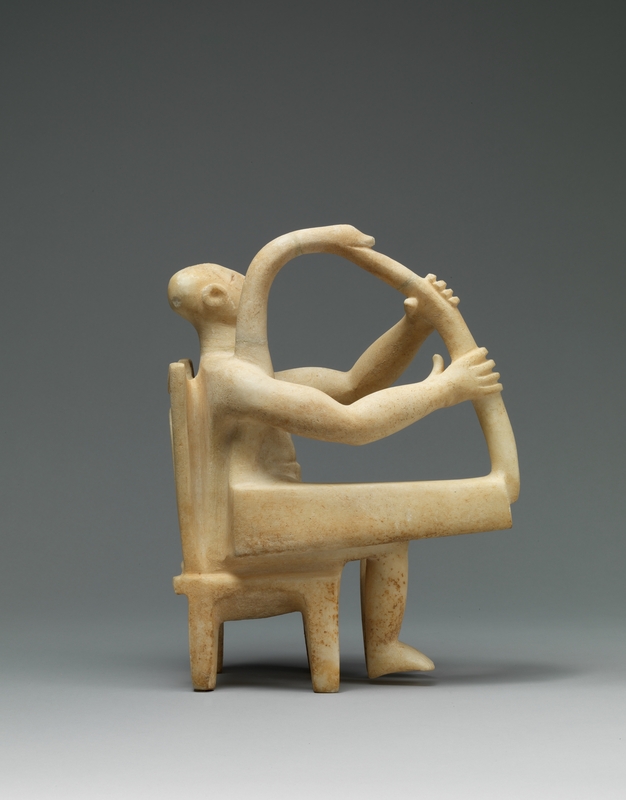 This object is an Early Cycladic marble sculpture-in-the-round representing a seated male harp player. 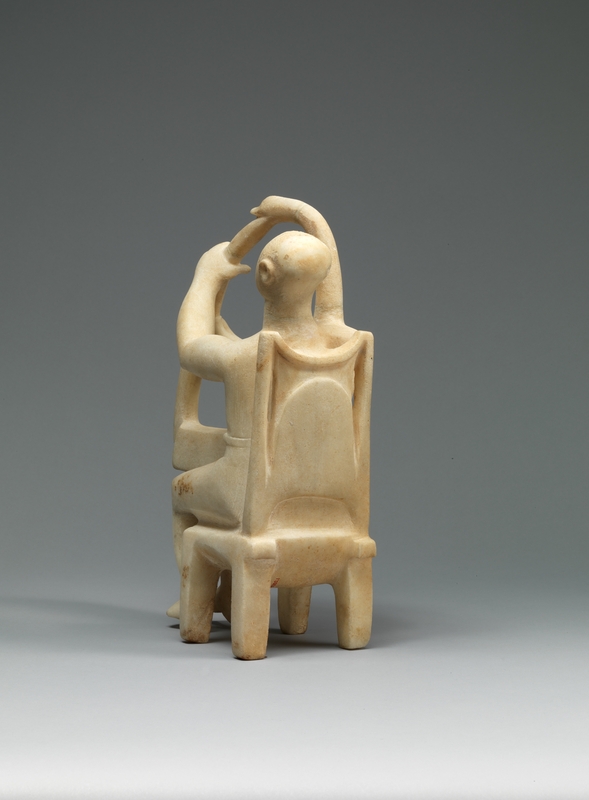 The man sits in a high-backed chair that reaches his shoulders. 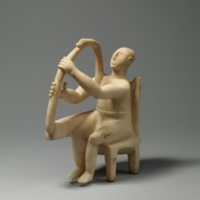 He holds a large harp on his right side. The harp is decorated with the head of a swan. It rests on the chair next to the man’s right thigh. 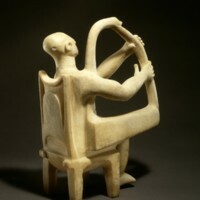 His arms reach around on either side of the harp so that the back of it – the neck of the swan – rests where his right arm meets his shoulder. The man’s head tilts back, his eyes shut and his mouth slightly open. He has a prominent nose and large ears, perhaps to better hear the music he is producing. The smooth marble surface was at one point painted with details as can be seen by its varied weathering. The figure is made up of simplified forms which exhibit just enough detail to indicate the subject matter. The balance and elemental geometry of the piece make it visually appealing to our modern tastes. 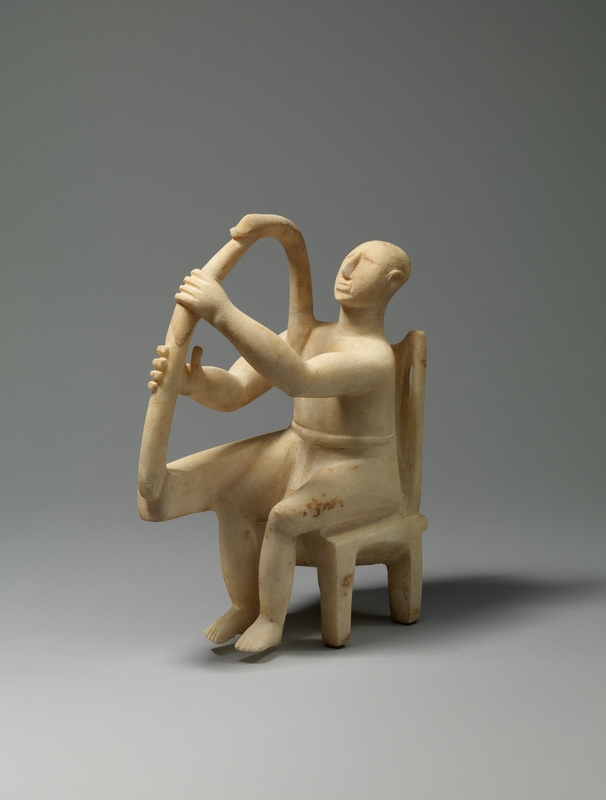 It is likely that this figurine represents a powerful and integral member of Early Cycladic cultures – the oral historian and musician. The artist who made the piece is unknown, but we can assert that it was made by an experienced sculptor. There are several important historical and cultural features of this object. Perhaps most striking is that it is one of many. 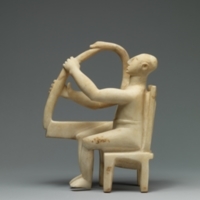 This gives researchers a frame of reference when studying the piece. It also indicates that the figures were relatively common objects. 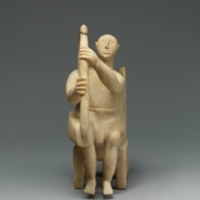 This collection of figures fits into the broader archeological record which gives us insight into ancient Cycladic life in the absence of written records. The fact that many of these objects were found in graves indicates that they probably often served funerary purposes. Another important historical trait of the object is what it likely portrays. 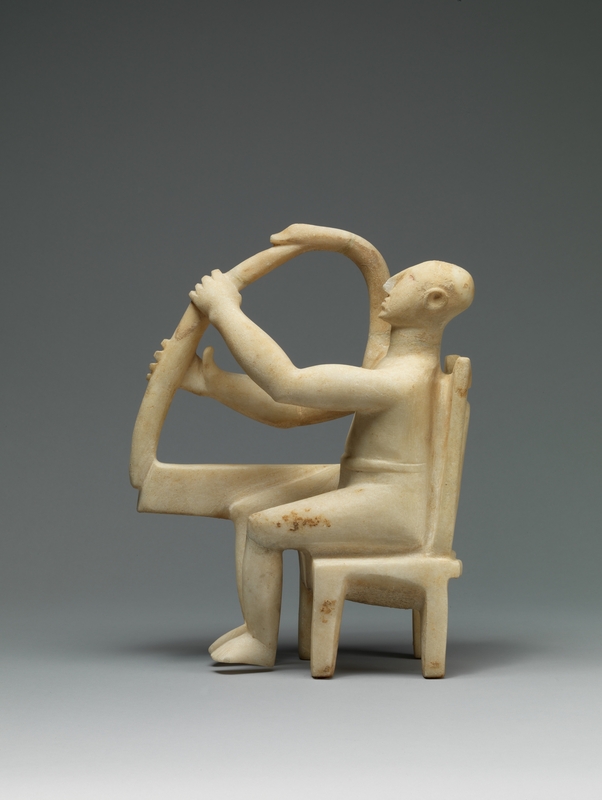 In a culture that lacked a written language, musicians acted as oral historians for their communities. Lastly, the simplicity and elegance of the sculpture is attractive to the modern eye because it reflects the core principles of twentieth and twenty-first century art. The modern popularity of such works is likely why so many of these objects have no known provenance, and also a reason why many of the works are forgeries. The high demand for these pieces allowed grave robbers to sell them to the art market without any historical records or documentation. 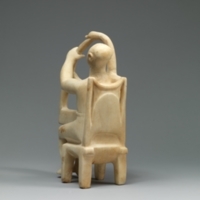 The sculpture fits into the Aegean Art chapter of Janson’s History of Art under the subheading Early Cycladic Art. This section discusses the archeological remains, specifically the artifacts found in ancient cist graves. 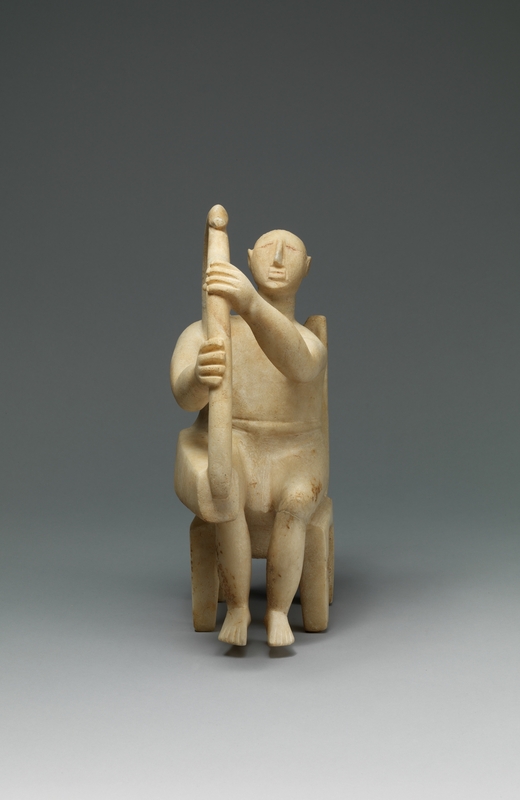 After briefly covering the “frying pan” palettes found in some graves, the book goes on to describe the commonly-found white marble Cycladic figures. 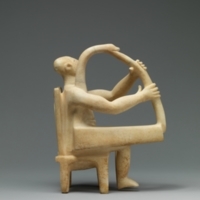 While the text mostly refers to the Cycladic women, it does make mention of the rarer seated male musicians. 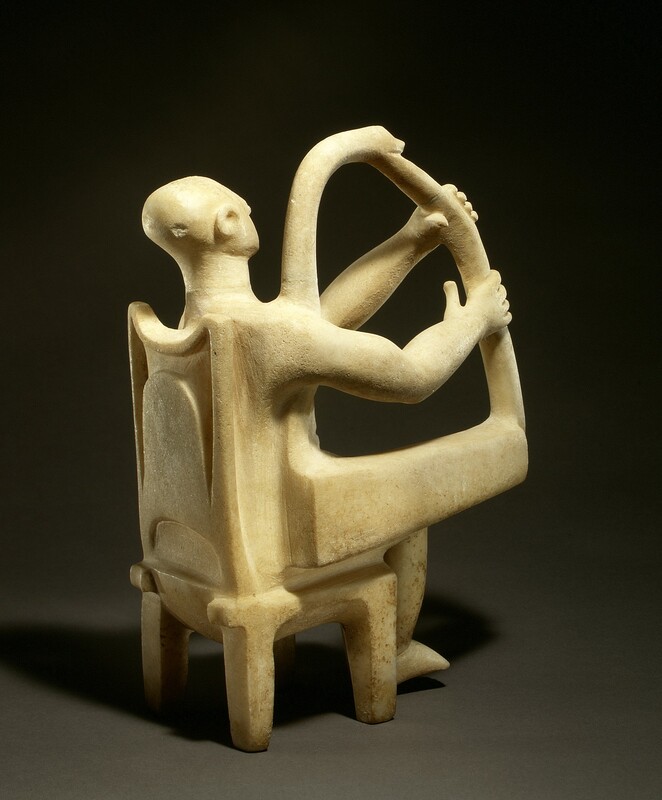 This marble seated harp player could replace figure 4.3 of the textbook, which is a similar white marble harpist from the Museum of Cycladic Art in Athens. ,” accessed April 22, 2019, http://metsurvey.kenyoncip.org/items/show/25.